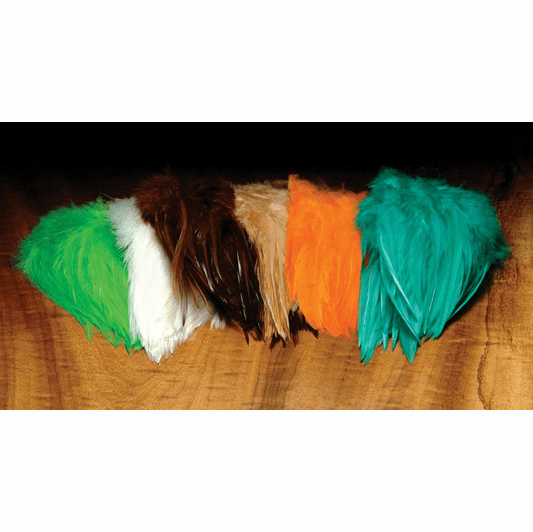 Home > Fly Tying Materials, Supplies and Tools > Rooster Feathers for Fly Tying > Hareline Dyed Over White Strung Saddle Hackle 5-7"
Hareline Dyed Over White Strung Saddle Hackle 5-7"
These saddles are a mainstay for all fly tyers. These saddle hackle feathers are used for tails,wings, throats collars and palmered hackles on larger flies. They are versatile and the colors are sharp and true. These strung rooster saddles are an excellent choice for anyone who ties salmon and steelhead flies; flies for trout, bass, and a huge range of saltwater flies. 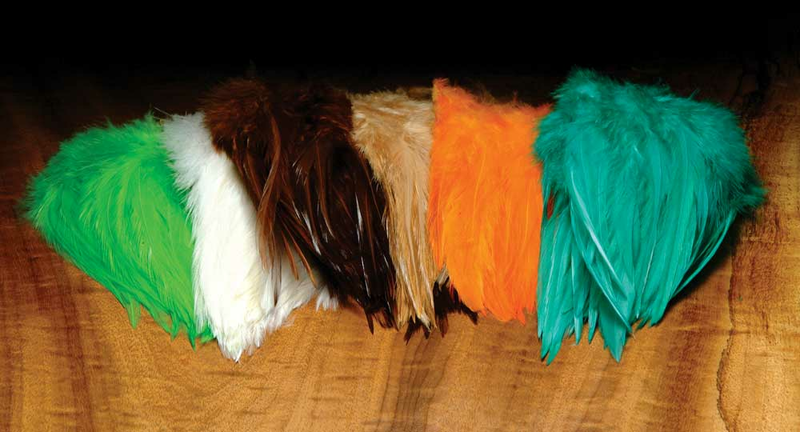 These saddle feathers come in a wide range of colors from subtle to bright. The feathers are stitched at the base and range from about 5 � 7� in length. It is essential to sort these to select feathers best suited to each size and style of fly you are going to tie. Most packages contain feather hackles appropriate to tie flies as small as about a #8 and as large as a #2. Some hackles have more web and some have less. We find that, on average, something like 2/3 of the hackles in a package are useful hackle feathers to use on some part of a fly. We find that these strung hackles provide some hackles for Buggers, some for hackle collars, some for tails, and throats. A great product for the tyer wanting to dabble with several colors and sizes of flies.